Summer in the UK might be playing a never ending game of peek-a-boo, with today at the "boo" end of the spectrum, but I hold out hope for a long hot spell, dear people. I may be deluded, but I think in a months time it shall be so hot you will be able to cook eggs on the pavement. Which shall give me even more to whinge about. But, in the mean time, I have been thinking about what to wear when one is waterside. Be it the pool or the sea. 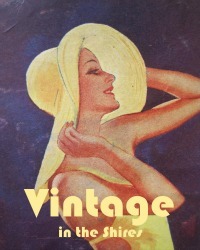 There have been some grand round up posts in my feed of late, namely Retro Chick's highstreet finds and there are some delish bits available from Penny Dreadful Vintage if proper vintagey-goodness is what you prefer in your beach bag. But, for me, I stumbled upon a gem of a company whilst looking for a skirted cossie. Be prepared for more of me than you have ever seen. There! I have done it! I am on the Internet, for all to see, in a swimming costume. What ever next? As you are aware, I am far from a size 10. The fact that I have chosen to post these shots of me, indicate that I am comfortable in my own skin. I think others & the media like to label me plus-size, fat, curvy or obese, depending on their angle. Personally, I am just me. I, like all women, love bits of myself and occasionally loathe others. I refuse to allow the bits I wrinkle my nose at stop me from living in any capacity. After having a twitter conversation with Betty Bee Vintage about where to find a longer-in-the-leg-than-average-retro-looking-swimwear she pointed me in the direction of searching for a "skirtini". I found one via an on-line catalogue, ordered and promptly returned on account of the shocking lack of support. A big sigh was released, and I thought "waaaaaah". And then, by chance, I found Swim Boutique. We had a lovely conversation over email, and they kindly offered to send me one their costumes for review. Thankfully, there was to be none of the immediate return and waaaahing of my previous attempt. Made to a high quality, this costume has soft cups for support and is in a bold pattern to mask the bits I don't like all that much. It has a low scooped back, which I feel could be a little higher to aid with support amongst my larger chested chums, but I would be happy to lounge about in this on the beach or a villa poolside. Based on this,I would recommend that this is a recreational-having-a-dip-getting-some-reading-done kind of garment. I am not too sure that the straps would stay put if faced with a 20 lengths front crawl. I think a higher back would sort this issue. But then again, I think it too pretty to be for exercise alone. I like that the front is skirted, which covers the tops of my thighs, although, I would prefer this to be about an inch longer for me to be truly confident. But that is just me. I also like the tie option at the side. This costume is not skirted at the back, but it is quite long in the leg, which stops my bum hanging out. Hurrah! And, on account of it being not so scorchio at the moment, or me living in the Med, my folks back garden had to do for the review. 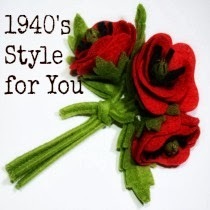 I have added some props to get you more in the mood for summery climes. Should you wish to have a butchers at Swim Boutique for your very self, you can find them here on the web and also follow them on FaceBook and Twitter. Come on Summer... hurry up! The sun has goneth from the my southerly UK location. Only behind some cloud, granted, but I can no longer feel it on my face. After basking in fairly high temps and slapping on factor 1 million suncream a few weeks back, we are back to coolness and rain, rain, rain, or at least the malingering threat of rain. Ho hum. But, I am not giving up on Summer. I refuse. I snaffled this delightful cotton blouse at a local jumble. I danced the Jumble Boogie with aplomb, grabbing anything I remotely liked the look of and, laden, retreating to a corner to sort through it. It set me back 40 of your finest pence. I teamed it with this corker from Acorn & Will which costs a bargainous £3.50 plus postage. I love the soft green colour and it resembles a Bakelite brooch I have seen around the webular. But for a tenth of the cost. It has not been cold enough for tights or brogues, but I still wanted some warmth. Enter a brown wool skirt and white sandals. And, what be that in my there hand? Why, could it be a new hand bag? That cost me £1 from an elderly couple at a car-boot? Who told me they have had it since they married in the late 40's? I spy a Woo in the picture! 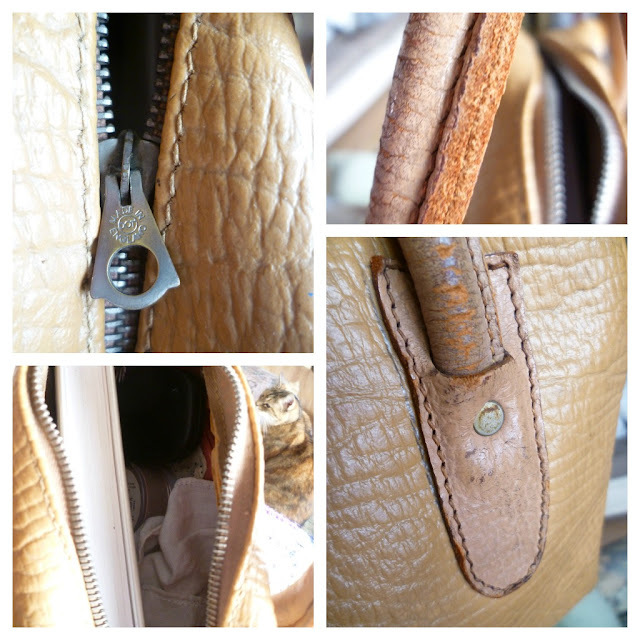 It smells of old leather and slightly of shed. Which I happen to love. I adore the fact it has a metal zip, it is big enough for all my needs - including a rather hefty book - and the handle is worn, but sturdy. Does anyone else name their plants? A rose bush in the garden maybe? Or a potted mint on the balcony? No? The money plant on the book shelf surely? No? Your poor plants. How do they know who they are? She even has a name plaque, which on the reverse tells her she is actually called Chives, but to me and The Beard, reminds us of this beauty's name. She has lots of new heads which are bursting into life. Handy for the Summer Solstice. Then again, I am surprised she has been able to lift her head up at all recently. I heart Geraniums. I truly do. I adore the fact that they look like little rosebuds before they open up. And you get so many blooms from these beauts. I do have some more on the balcony, but as geraniums do well indoors & out, Gerty asked to stay put as she was feeling poorly crook. She has now become part of the kitchen. She is coming along a treat. So, not many of you out there name your plants, eh? Hmmm.. maybe it comes from seeing Little Shop of Horrors at an early age. 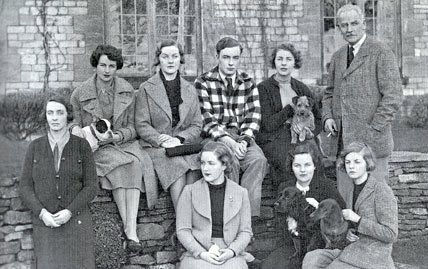 The true story behind the gaiety and frivolity of the six Mitford daughters - and the facts are as sensational as any novel: Nancy, whose bright social existence masked an obsessional doomed love which soured her success; Pam, a countrywoman married to one of the best brains in Europe; Diana, an iconic beauty, who was already married when at 22 she fell in love with Oswald Moseley, the leader of the British fascists; Unity, who was romantically in love with Hitler, became a member of his inner circle before shooting herself in the temple when WWII was declared; Jessica, the family rebel, who declared herself a communist in the schoolroom and the youngest sister, Deborah, who became the Duchess of Devonshire.This is an extraordinary story of an extraordinary family, containing much new material, based on exclusive access to Mitford archives. 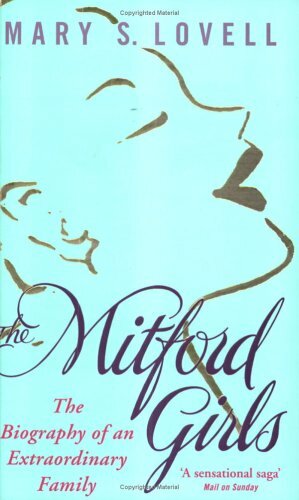 I have long been mildly interested in the Mitford Sisters. Always from afar and not really knowing all that much about them, except one was a novelist, one shot herself and one of them is still alive. I thought that by reading Mary S Lovell's biography, any questions I had would be answered and I could put the topic to bed with a tick in the "yes, I know about that" box. 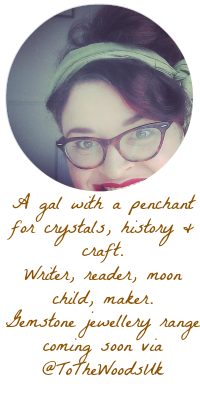 However, like all good books, it has only served to fuel my interest and has led me to add many books about them as a collective group and individuals to my wish list. Lovell's writing style is easy to follow and she includes details from the everyday to the extreme. From the very beginnings of the family all the way through to the remaining sisters (although, sadly, there is now only one) every aspect is there. It really is a rollacoaster of a ride. There were some bits that made me think "hang on.. the Churchill's? The Kennedy's? Hitler?" Yes - they knew them all. The intimacy and the loathing, the laughter and the tears, the love and the loss - it is all here. The book gives fair attention to all the siblings, but I found that Pamela and Tom were a little thin on the ground. I do not think that this is due to lack of research by the author - but a lack of information to research. Fret not - the others are there in abundance. With bells on. The Mitford Girls gives not only a glimpse into a world now all but gone, but also into the lives of a dynamic group of siblings. Ooooooh weeee! Have I got a whole heap to share with you today. Recently I was invited by writer Akeela to to attend a very special trip. When I received the email, I kept re-reading it, such was my disbelief. Along with Margaret, Claire and Gemma, Akeela and I were off for a day out of epic proportions. 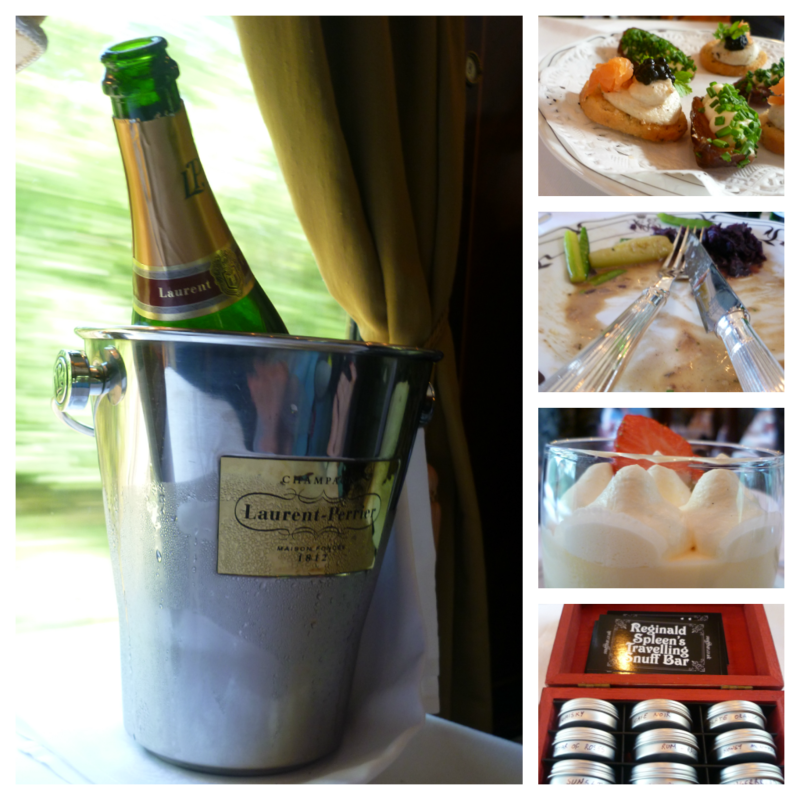 On none other that The Orient Express British Pullman. This shall be pic heavy - but they are of some right nice stuff - so enjoy! It was an early start of heading off to London Victoria to board this magnificent steam train. I was bleary eyed, but beyond excited. Even on the day of the event, I could not believe it. We checked in and were given our boarding passes. In a leather wallet. Which is mine to keep forever more. It made me feel like a traveller from a bygone era. And like I should have been wearing gloves, a big hat and asking Jeeves to take care of the my luggage and the Afgan hound. 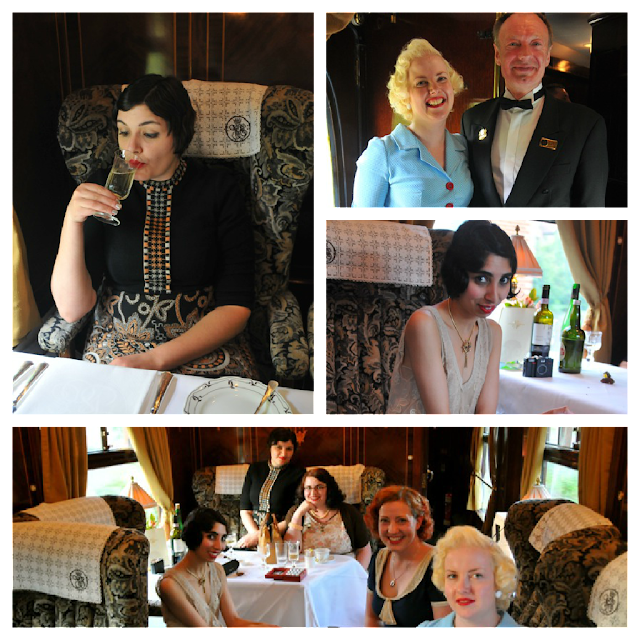 We were seated in coach Minerva - a 1927 original that was used as part of a very special passenger service in 1951 for the Festival of Britain. She then went on to form part The Devon Belle and later, The Golden Arrow. Each carriage has it's own name, a touch I loved, and it's own history. And, oh my, so beautifully decorated. I am not too sure what I was expecting, but individual, uphosltered armchairs was not on my list. Nor were monogrammed seat covers. Or spherical seat numbers. And all this before I had even sat down. We were all so in awe of our surroundings, I am not too sure a Peach Bellini was the right thing for me to quaffing at 9am, because it only made the butterflies that were hurling around my tummy, worse. 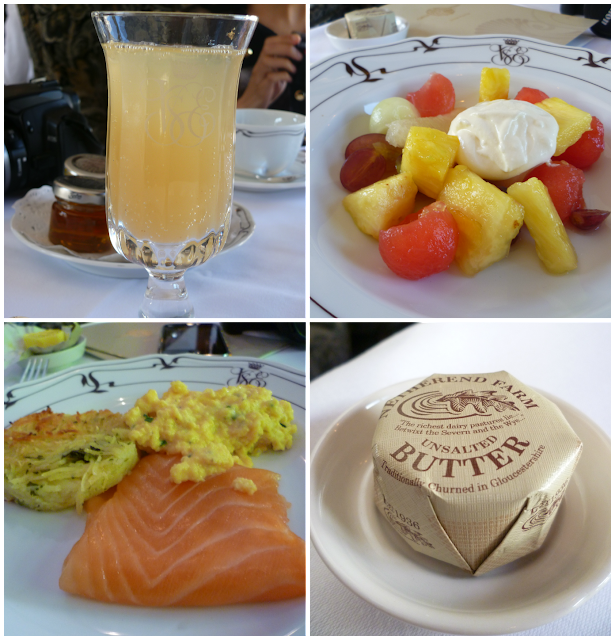 I was very pleased when something to munch on arrived, in the shape of fresh fruit salad, smoked salmon, scrambled egg, potato rosti and fresh warm rolls. And a whole truckle of butter. 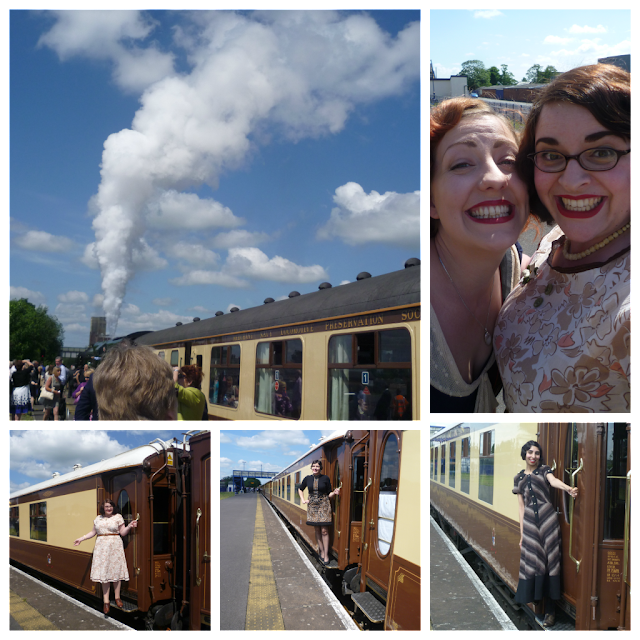 We soon became accustomed to the jiggery of the train and decided to grab some outfit shots. I made a new dress especially for the trip. It is from the same pattern as here and here, and again from thrifted fabric and embellishments. And I have to say, it is the frock I am most proud of. Proof that practice pays off! Claire, Gemma and I decided to head off down the train to investigate the other carriages. We had heard a rumour that all of them are individually decorated and we wanted to know what other people had in theirs. 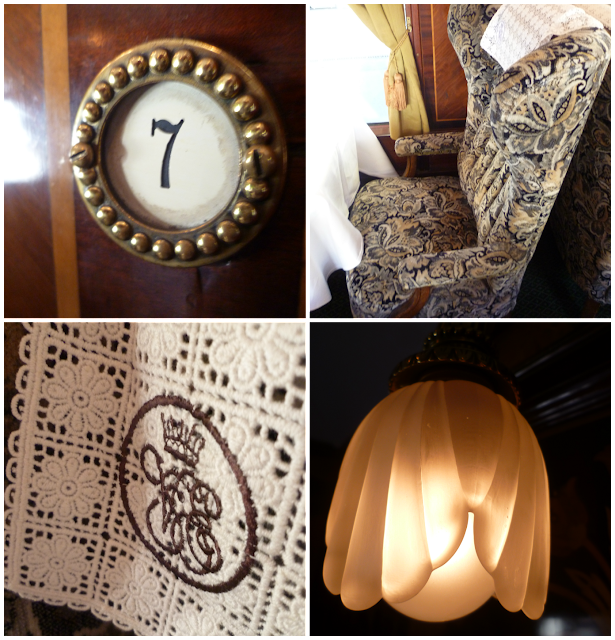 Each carriage on the British Pullman is furnished to such a high standard that I became awe-struck all over again. The sun was blazing (which was a treat as it seems to have been raining in the UK since the year dot) and the train slowed to a stop. This was so the engine could be watered and a huge plume of steam expelled. And for us all to get off, pose and gawp at said steam. More exploring was to be had, so we headed off to the kitchen to meet the Chef who was expertly preparing delicate canopes, whilst maintaining his balance and not shoving a thumb into the food artwork he was making. The man had skills. 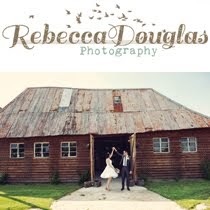 The staff were just the right amount of professional, polite and friendly. 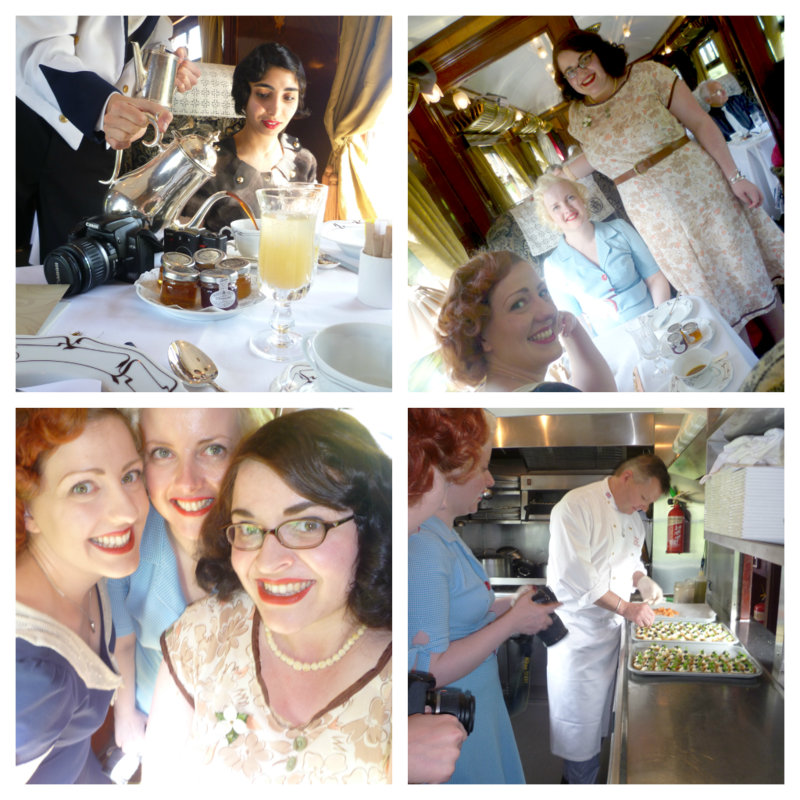 There was plenty of courtesy and "Madames" whilst they poured tea and, later on, piping hot soup on a wiggly moving train - all without spilling a drop. But, I found that you could also have a bit of a laugh with them. They were very interested by and impressed with the fact that we had "dressed up" for the occasion. And despite one passenger trying to convince us that we do not, you-just-can't- nope-I-don't-believe-you style ourselves like this full time, the interest we generated was of a comfortable level. After reaching our destinaton of Bristol Temple Meads station, and heading off for a whistle stop tour of the ss Great Britain (more on that in a separate, special post all of it's very own) we were back aboard and homeward bound. Dinner of Aspargus & Leek soup, pork tenderloin & mash, cheese & crackers and the most divine Strawberry & Elderflower trifle were all washed down with wine, champagne and tea. And then some snuff thanks to Gemma and Reginald Spleen's Travelling Snuff Bar. I had to peg it across Victoria station to catch my train home, which left me feeling like I had ended the day rather too soon. But, the memory (which still feels a bit like a dream) shall stay with me for life. Should you be interested in a day out on this wonderful service for your very self, you can find all details here. There really is very little as evocative as the noise of a steam train. From the white clouds spilling out of the chimney, to the sound of the clickety-clack along the tracks. Team that with the incredible interiors and first class service and it really was the perfect day out. Today's post comes to you from the gracious and lovely people over at Lotty Blue. I was recently alerted to this company and after a conversation with the wondrous owner, Lisa, we came to an agreement. We discussed sponsorship, and the result was this delightful apron for review and an advertising on my little bit of web space. A fair swop, I feel. I was offered my choice of aprons and much deliberation ensued. Did I choose the May or the Lola? I decided upon the May. I like me green and pink. But, I have just spotted the Agatha. Now I want that one too. Sigh. One can never have too many aprons. Can they? A pocket!! And a deep pocket at that. When I am cleaning, I like to have everything I need on me. The pocket on this garment is big enough to fit a can of polish, duster and my iPod. I love the shape of the apron, which I think is very flattering. My only bug bear would be for a little more material up top, as it didn't quite cover my boobage. Luckily, I am prone to wiping my hands, when cooking or washing up, on the tops of my legs. And the feature that I adore most about the apron is that it goes right round my side, nearly to my hip. Protecting my frockery. The May is incredibly well made, and I wager the others in the collection are too. And each apron comes with a little monogram of the company name - a touch I really like. I love the feel of the durable, but comfy cotton. I washed this at a pretty hefty temperature, after deciding to splash myself with bolognese sauce. For this review. Natch. 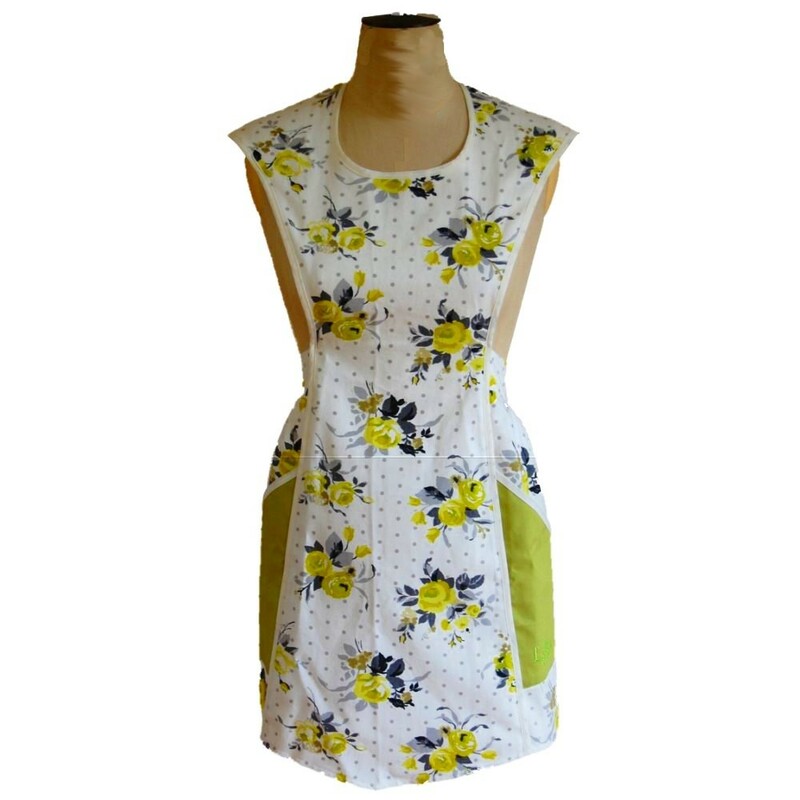 The price on some of the aprons may seem a little high for, well, something you wear to do the housework, gardening or cooking in - but - with that cost ( The May is £37 + p&p) you get utmost quality. And they are made here, in the UK, to a staggering standard. The below are some of my faves (the Agatha is winking at me) - ranging from under £20, to just over. Is it possible to just wear aprons all the time? To see the full selection, hop on over to here. 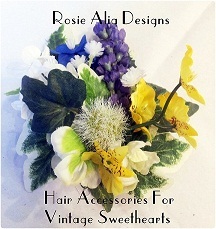 You can follow these lovelies on Twitter @lottyblue and also have a peek at their FaceBook Page. Welcome to a spiffing new sponsor! I was thrilled to be able to review this book, after being sent it by publishers, Harper Collins. It is right up my street and I could not wait to get started. The following review is my own, despite being sent it. I love reading about well known brands and how they came about. Be it Cadburys, Kellogs or, in this case, Tate & Lyle. But, what I love more is learning about the actual workers, the real life human experiences. And this book has it in spades. The narrative of the book is somewhat softer than the sort of social history books I am used to, which I relished. That is not to say that it is dumbed down in any way. It is a nice and easy read. Think of as listening to a bunch of elderly ladies telling you about their lives over tea and dead-fly biscuits, with someone else at the table dropping in bits of company history as you dunk & slurp away. Kinda like that. The book follows several women through their time at Tate & Lyle, as well as how the company itself has shaped over time, from an employer for an entire area to an automated production line. 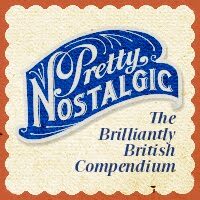 I really enjoyed the flow of the stories, jumping from one lovely lady to another, taking us along for the ride through her time with the company and the fond memories of working within a team full of cheeky chaps and headscarf glamour. I found myself gripped by certain parts of the book, exclaiming, on more than one occasion "oh, how very sad". But this was soon replaced by smiling at someone else's recollection. 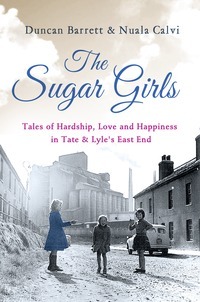 A grand book that gives you an insight into a now forgotten and replaced society of hard working gals. So. 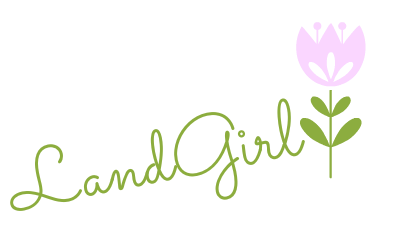 If anyone reading this follows me on Instagram (landgirl1980) - you may have noticed sneek peeks of my newest home made dress. I made this special, for the Diamond Jubilee, like. As you do. Well - as I do. It made it to the same pattern as my other attempt, but for some reason, second time round was a whole lot harder. I f*cked it up Royally (pun intended), I shall not lie to you. And I won't bore you with the photos I took of my anger and dismay. It was caused by the weave of the broderie anglaise fabric I had chosen and the fact I needed it to be vertical. This meant that the skirt parts I needed to cut on a fold could not be done. So I made it up as I went along. I also needed to line it - which meant a whole lot more cutting, pinning and sewing. The machine ground to a halt on more than one occasion. Then I ran out of fabric. Tears and snot ensued. And a lot of more, colourful, swearing. Sh*t the BED! Is that what it looks like from the back? Gahhh! This is after a windy day near the sea. Still, I should of brushed it for you.. In short, I began to hate this dress. And in turn, any thought of getting into Jubilee spirit. But then, it all started to come together. I ditched the machine and did the last bits by hand. This after being in the car for a bit. I should have pulled my belt down. Two white panels!! I wish I had thought about it before, as I think I would have liked alternating all the way round, but, I shall know for next time. I had bought Union flag ribbon to go round the neck, but I decided against it at the last minute. I want to be able to wear this dress minus the red accessories at some point, and the ribbon would have looked all wrong in that instance. And, to top off my joy of not abandoning this dress, I found this antique George V & Queen Mary coronation pin at Victorious Vintage in Portsmouth on the Saturday. I mentioned my love of the Royal memorabilia last week so I was thrilled. I think I did a little dance. I may have clapped. All in all, I must have fallen in love with this creation at some point, because I wore it out the house. And plan to wear it again. Hope your's was a goodun!